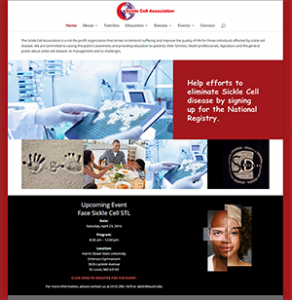 We’re very excited to announce the debut of the new Sickle Cell Association St. Louis website. You can learn more about the organization on the ABOUT page. We invite you to take a look around the website and learn how you can GET CONNECTED. FACE SICKLE CELL STL is on Saturday, April 23, at Harris Stowe State University. The 5th Annual SICKLE CELL STROLL is on Saturday, September 10, on the campus of Washington University School of Medicine. Sickle Cell Stroll 2016 is a walk to raise awareness of sickle cell disease. It is an event designed to celebrate the lives of those with sickle cell disease and to educate the community about the disease. Whether you have sickle cell, know someone who does or would like to show your support, come stroll with us!